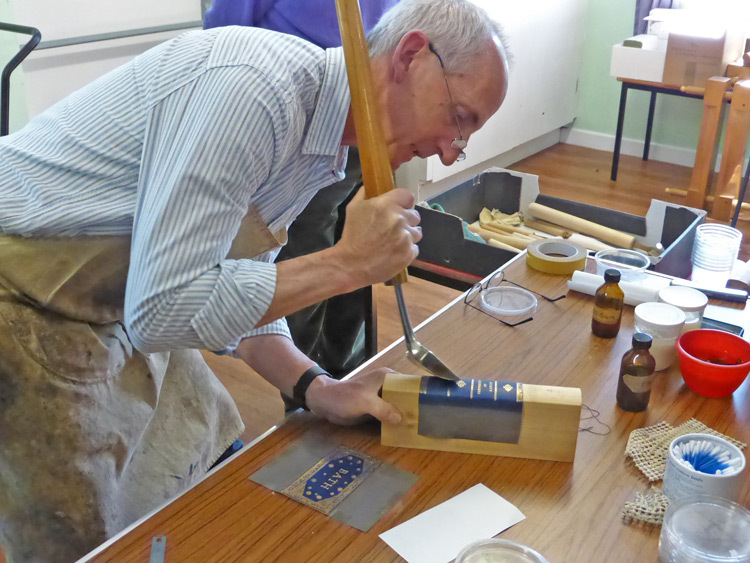 In conjunction with Designer Bookbinders the Society organises an annual series of weekend workshops. 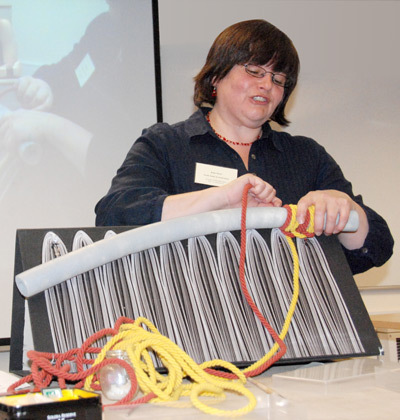 These workshops offer structured, intensive learning from established teachers and are designed to stress the ‘hands-on’ approach where students complete a structure or technique following demonstrations from the teacher. The size of each workshop is limited to allow students to benefit from individual attention. The 2018/19 programme has been organised by Sarah Burnett-Moore. For full details about each of the workshops, please choose from the tabs above. Workshops usually take place on a Saturday and Sunday from 10am to 5pm with suitable breaks. The fee for each workshop is £175 plus a charge for materials provided by the tutor and payable ‘on the day’. We hope you will be tempted – but please remember that the workshops tend to fill up very quickly, so sign up early to avoid disappointment. For all enquiries and further information, please contact Sarah Burnett-Moore. Learn how to gold-tool an image with the spontaneity of a drawing. This is a great introduction to gold-tooling on paper and the creative use of the medium. If you have never gold tooled before, this short structured course offers both the possibility to develop a practical grounding in the processes and techniques specific to tooling with gold leaf on paper, as well as opening up the creative potential of the medium. If you have gold tooled before, this course is an opportunity to build on your knowledge by learning the technique of creating free flowing lines through the highly technical and process driven medium of gold tooling. Tracey Rowledge studied Fine Art at Goldsmiths’ College, London, and Fine Bookbinding at Guildford College, Surrey, UK. She exhibits internationally and her work is held in various private and public collections. Awards Tracey has received include support from the Crafts Council to go on the 2008 Cape Farewell Expedition to Disko Bay, Greenland and, in July 2016, she began a one year residency with silversmith David Clarke at Tunbridge Wells Museum and Art Gallery, UK. This culminated in 2018, in an exhibition entitled Shelved at Tunbridge Wells Museum, Library and Adult Education Centre. Tracey teaches gold tooling and aspects of bookbinding; she is a partner in Benchmark Bindery, established with Kathy Abbott, where book conservation underpins their bookbinding work. She is also a founding member of the international bookbinding group: Tomorrow’s Past. The transition from wooden to paper-based boards towards the end of the 16th century marks a significant development in English bookbinding history. Pulp boards were thinner, lighter and better suited to the new fashion for gold tooling; importantly, they were also much cheaper, helping to maintain pace with increased demand for smaller and cheaper printed books. Those attending this workshop will make a facsimile based on an early 17th century Oxford pulp board binding. This workshop will focus on typical structural features including: stub endleaves with printed waste; tawed thong supports laced onto pulp boards; edges trimmed in-boards and coloured; hand-worked indigo endbands; and a plain leather covering with blind tooling. This will be a busy hands-on workshop, but also aims to provide an insight into the transitions happening within bookbinding in the early modern period. Suitable for those with some bookbinding experience. Arthur Green is an independent Book Conservator with particular interest in the history of the book. After five years working as a bookbinder he graduated with distinction from a Post Graduate Diploma in Conservation at Camberwell College of Arts in 2008. Following internships at The Leather Conservation Centre and The British Library Arthur worked for the Oxford Conservation Consortium; he then spent over five years working at the University of Oxford’s Bodleian Library. Arthur has published on bookbinding and conservation and started teaching in 2012. In 2016 he established his own conservation studio in Oxfordshire. The workshop will provide an introduction to the making of a unique and distinctly non-traditional artists or complete book. The structure will be based on a ‘Drum Leaf’ variant and be hard bound. Students will have the chance to explore different mediums to first make a text block and then a full cloth binding. Participants will, again, be encouraged hand colour, manipulate and further extend the bookcloth, each creating a unique book. Mark Cockram was elected Fellow of Designer Bookbinders in 2001, Brother of the Art Workers Guild in 2008. After studying art and design at Lincolnshire College of Art, Mark worked as a freelance artist and designer. Mark graduated from the Bookbinding course at Guildford College and later BA Hons Book Arts at London College of Printing. Mark opened his first bookbinding studio in Lincoln in 1992 and Studio 5, London in 2003. Mark’s diverse work is represented in national and international collections around the world. Mark teaches from Studio 5 in London UK, and both nationally and internationally. In 2017 he was the faculty Fellow for the New York Center for Book Arts. Current projects include exploring ways in which the book can be viewed within the contexts of the exhibition and the public or private collection, the artist’s book and creating 3-dimensional, extended book sculptures and formats. A major theme of recent work has been to make more from less, to engage in up-cycling materials to make books. The workshop is to find the best possible approach in restoring pre-1800 bindings with detached boards whilst preserving original materials as much as possible. Procedures covered: spine lifting; endbands reinforced, repaired or resewn if missing; repair of board edges & corners; reattachment of endpapers & original boards; paring and staining new leather for spine; rebacking; preserving & re-attaching original spine, if available; gold tooling where appropriate/necessary; furbishing. Suitable for more experienced binders. Flora Ginn studied calligraphy and bookbinding at Roehampton Institute in London before working with Bernard Middleton for twelve years. She is a Fellow of Designer Bookbinders and runs her own bindery undertaking restoration and fine binding work to commission. The workshop begins with making a sixteen-page book with a detachable cover from a single sheet of paper. Each of the six spreads contains a different movable structure – house, furnished room, Turkish map fold, secret box (with a message inside), sailing boat and palace. Japanese locked cards adorn the cover. We will devise a narrative that links these forms and create a story that weaves its way through the pages from beginning to end. Paul Johnson lives two professional lives – as an educator with an international reputation for developing children’s writing through the book arts, and as a book artist. His published books include A Book of One’s Own and Literacy Through the Book Arts. He has made books with over 25,000 teachers and nearly 200,000 children worldwide. His unique pop-up books are in most of the major collections in the USA. He has received the Colophon Award from the Canadian Bookbinders and Book Artists Guild, and the Portnall Award from the UK Society of Bookbinders. In 2019 The Johns Hopkins University acquired over 500 pieces of his original work dating from the 1960s. Binding with a stub, or loose guard, has been around for centuries. Mainly used for maps and documents in the past, it is only recently that it has become popular in contemporary work. Workshop participants make a small library of templates/models with various stub constructions for use as future reference. These are a mixture of basic methods and more complex, versatile and decorative techniques. The models show how to use a stub on a single section, multiple sections and sections combined with plates or plates only. They make use of individual stubs and stubs made from concertinas. Various folding patterns are explained as well as how to attach boards and incorporate endpapers. If time allows a multi section, rounded book will be made. This structure is very adaptable and some of its merits include: the text block opens flat; all spine styles are accommodated whether flat, rounded or rounded and backed; the creation of elegant bindings from single sections;narrow gutter margins no longer disappear in the spine; successfully backing books with thick paper; attaching plates with no sewing. Lori Sauer trained at City Lit, London under the tuition of Sally Lou Smith and David Sellars. She is now self-employed and specialises in contemporary bindings. For 20 years she has run Salisbury Book Crafts and in 2011 founded BINDING re:DEFINED. In 2000 she won the Designer Bookbinders Silver Medal and in 2001 became a Fellow of Designer Bookbinders. Lori is the Emeritus President of Designer Bookbinders. Click on the icon below to view / download a PDF version of the Joint Workshops Registration Form that you can print out and fill in.